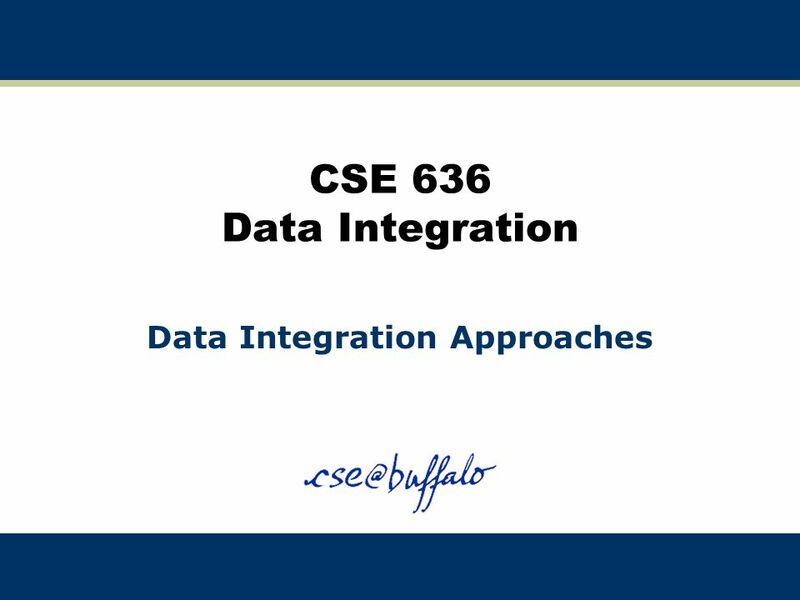 CSE 636 Data Integration Data Integration Approaches. 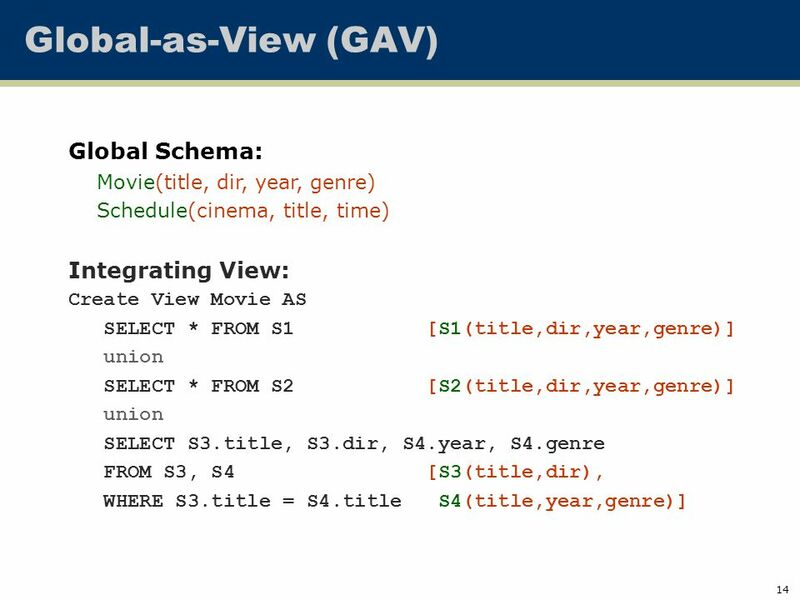 16 16 Global-as-View: Example 3 Global Schema: Movie(title, dir, year, genre) Schedule(cinema, title, time) Integrating Views: Create View Movie AS SELECT NULL, NULL, NULL, genre FROM S4 [S4(cinema, genre)] Create View Schedule AS SELECT cinema, NULL, NULL FROM S4 [S4(cinema, genre)] But what if we want to find which cinemas are playing comedies? 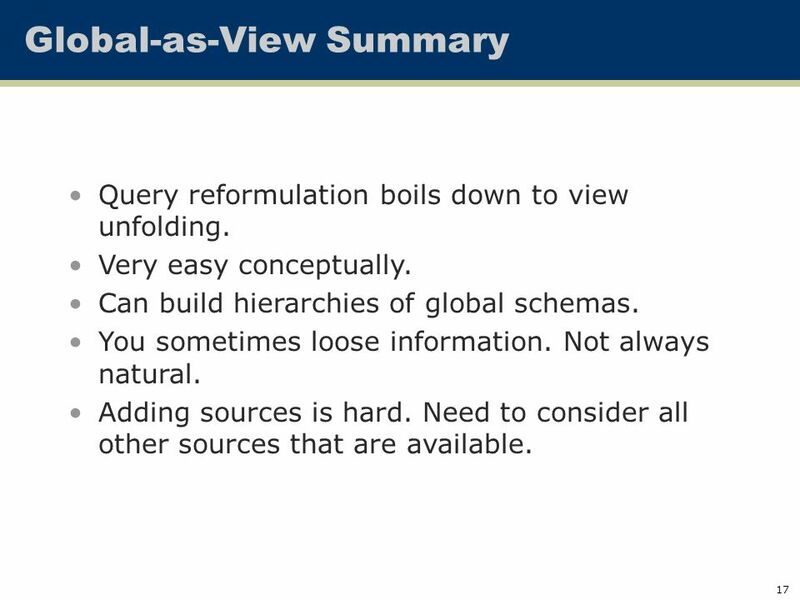 17 17 Global-as-View Summary Query reformulation boils down to view unfolding. Very easy conceptually. 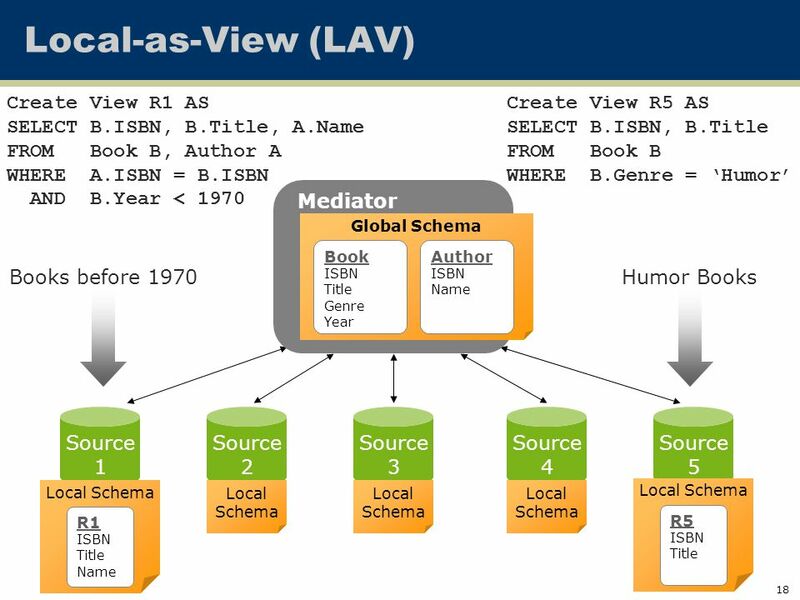 Can build hierarchies of global schemas. You sometimes loose information. Not always natural. Adding sources is hard. Need to consider all other sources that are available. 20 20 Query Reformulation Mediated Schema Source 1 Source 2 Source 3 Source 4 Source 5 Local Schema Local Schema Local Schema Local Schema Mediator Global Schema Book ISBN Title Genre Year Author ISBN Name R1 ISBN Title Name Local Schema R5 ISBN Title Books before 1970Humor Books Query: Find authors of humor books before 1960 Plan: Can’t do it! 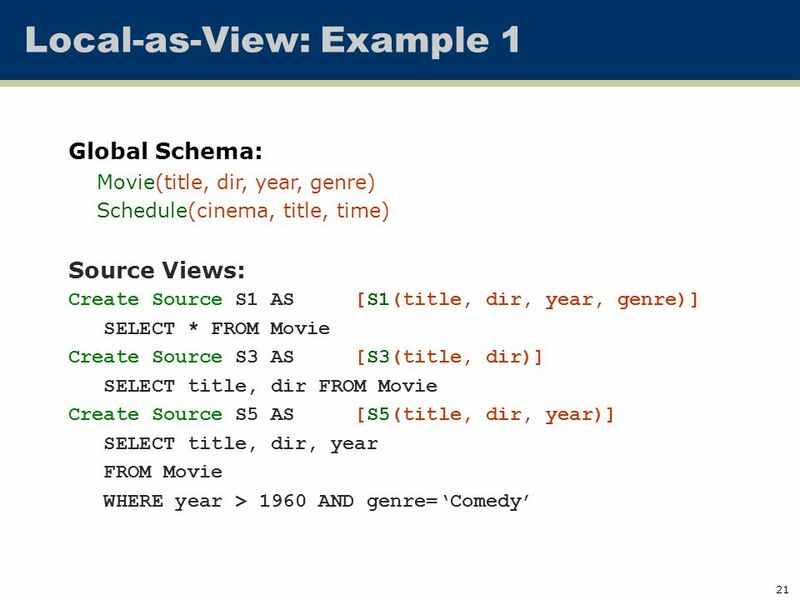 22 22 Local-as-View: Example 2 Global Schema: Movie(title, dir, year, genre) Schedule(cinema, title, time) Source Views: Create Source S4 [S4(cinema, genre)] SELECT cinema, genre FROM Movie M, Schedule S WHERE M.title=S.title Now if we want to find which cinemas are playing comedies, there is hope! 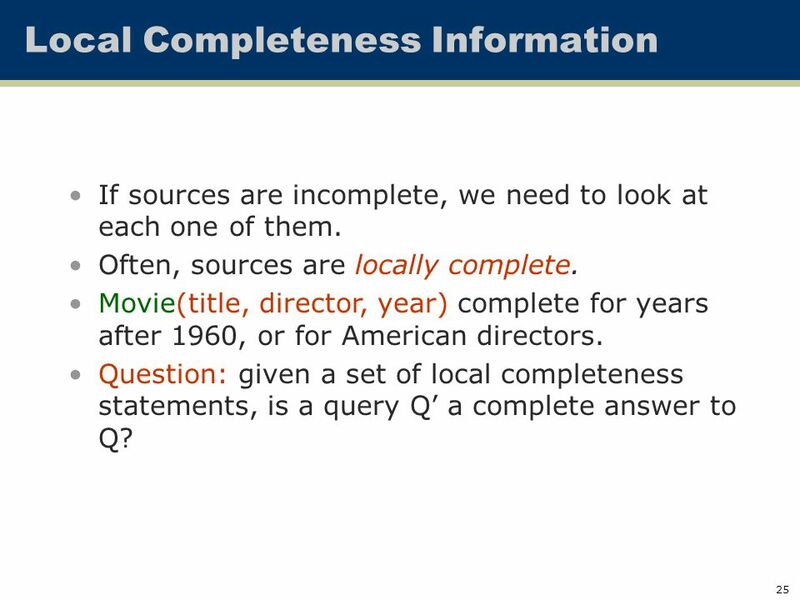 25 25 Local Completeness Information If sources are incomplete, we need to look at each one of them. Often, sources are locally complete. Movie(title, director, year) complete for years after 1960, or for American directors. 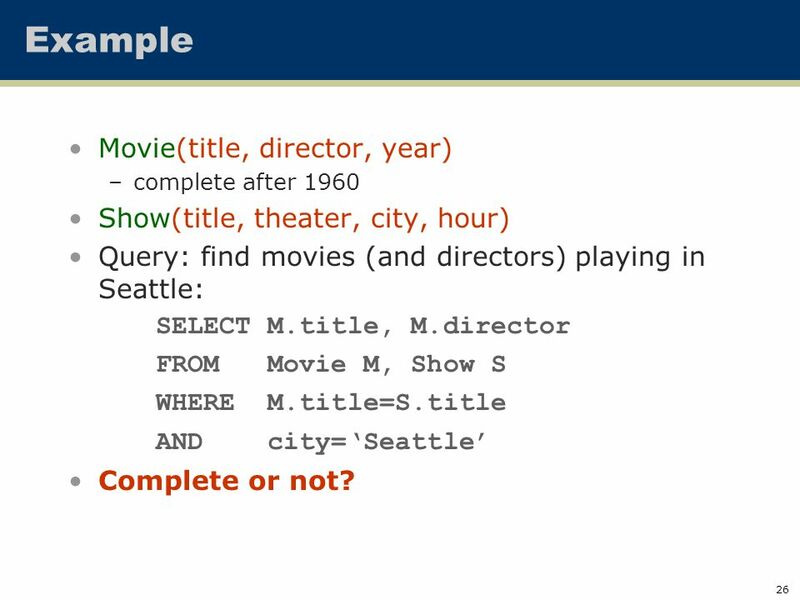 Question: given a set of local completeness statements, is a query Q’ a complete answer to Q? 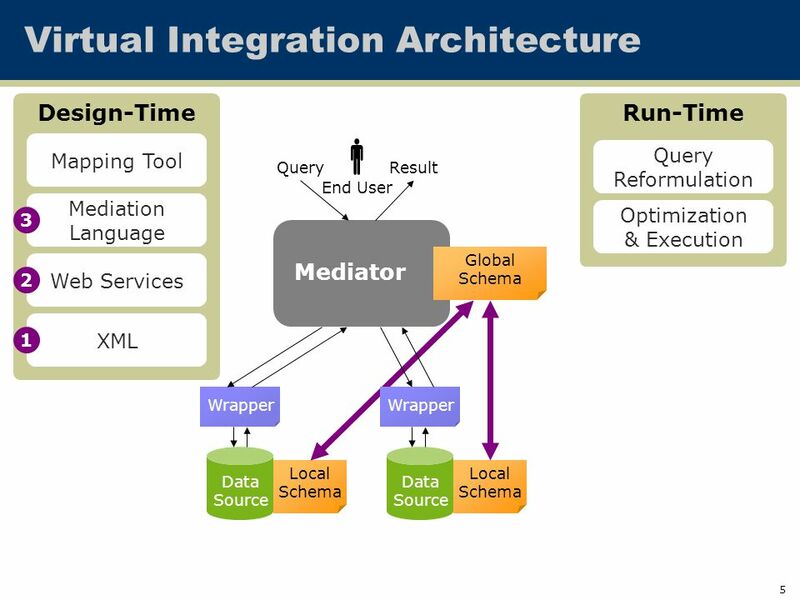 Download ppt "CSE 636 Data Integration Data Integration Approaches." Università di Modena e Reggio Emilia ;-)WINK Maurizio Vincini UniMORE Researcher Università di Modena e Reggio Emilia WINK System: Intelligent Integration. 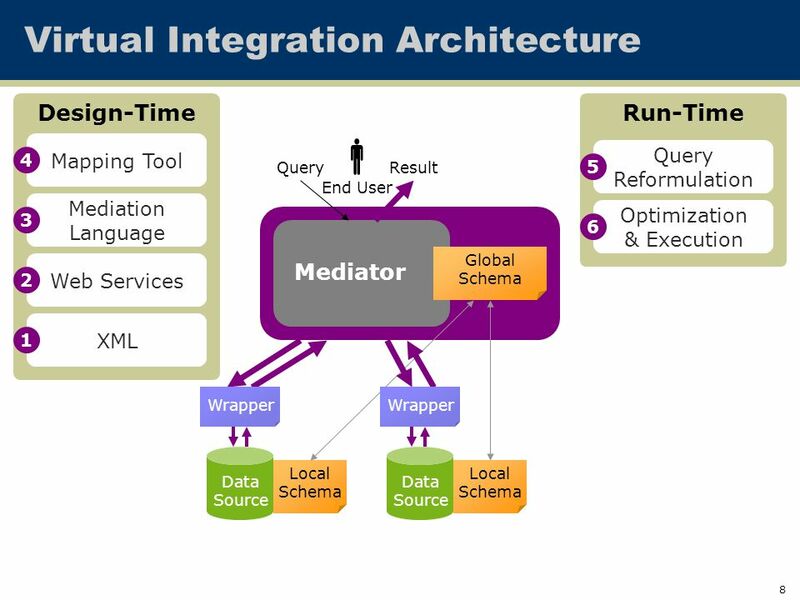 1 Data Integration June 3 rd, What is Data Integration? 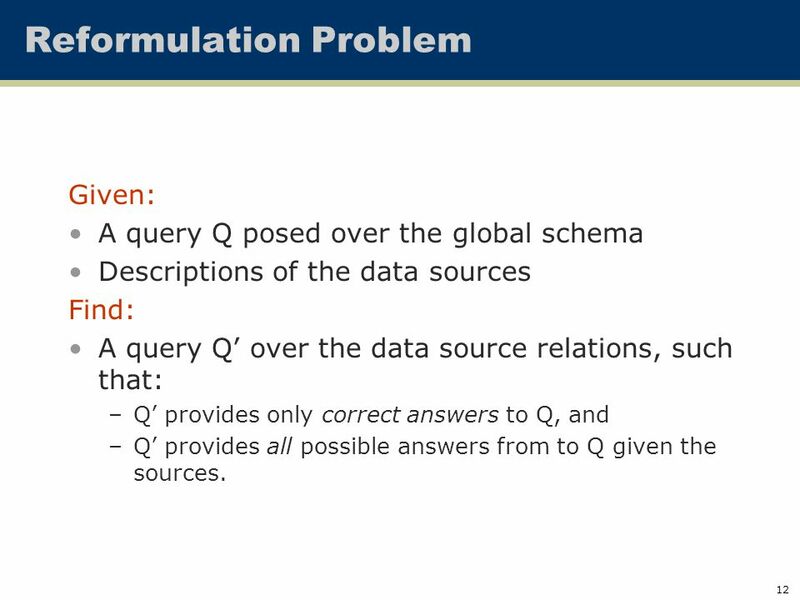 uniform accessmultiple autonomousheterogeneousdistributed Provide uniform access to data. 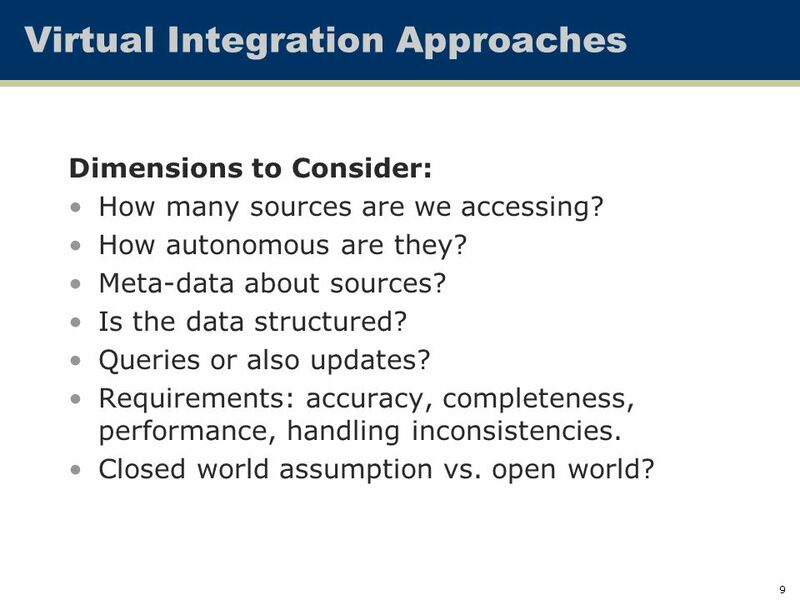 ANHAI DOAN ALON HALEVY ZACHARY IVES CHAPTER 1: INTRODUCTION TO DATA INTEGRATION PRINCIPLES OF DATA INTEGRATION. 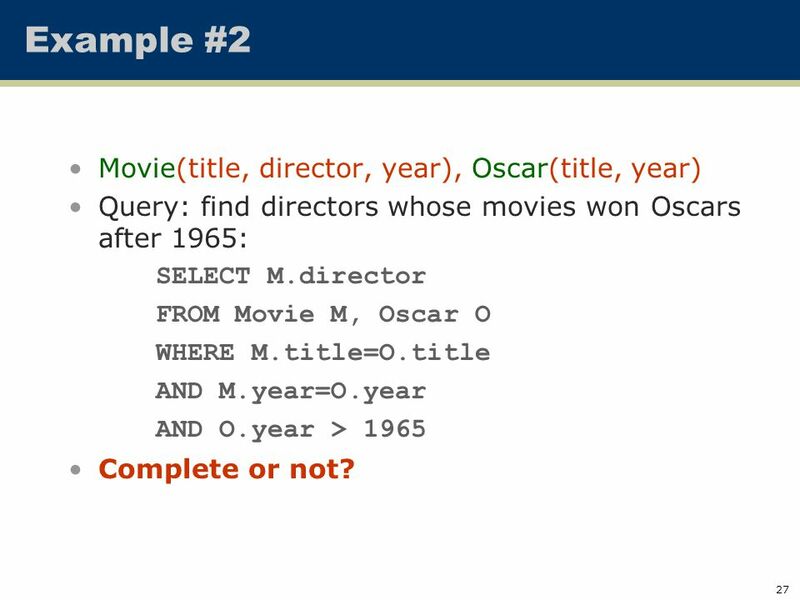 Manipulation of Query Expressions. 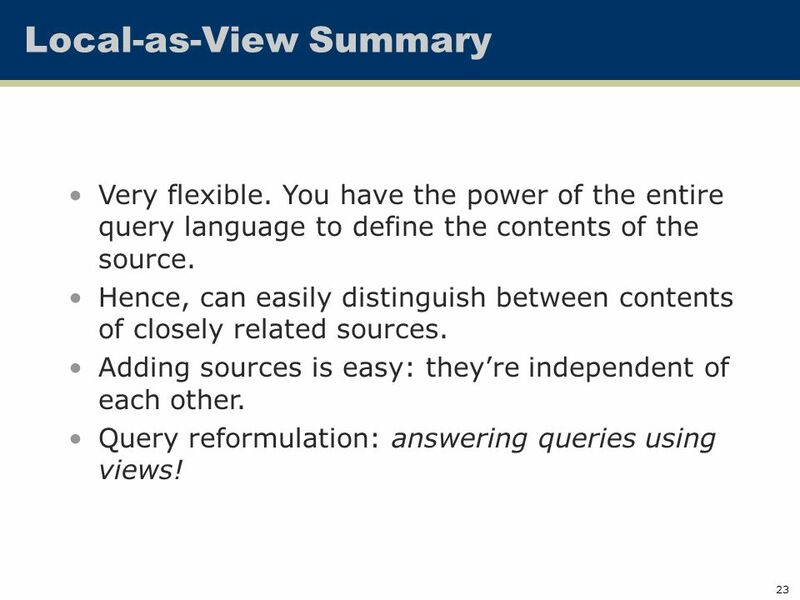 Outline Query unfolding Query containment and equivalence Answering queries using views. 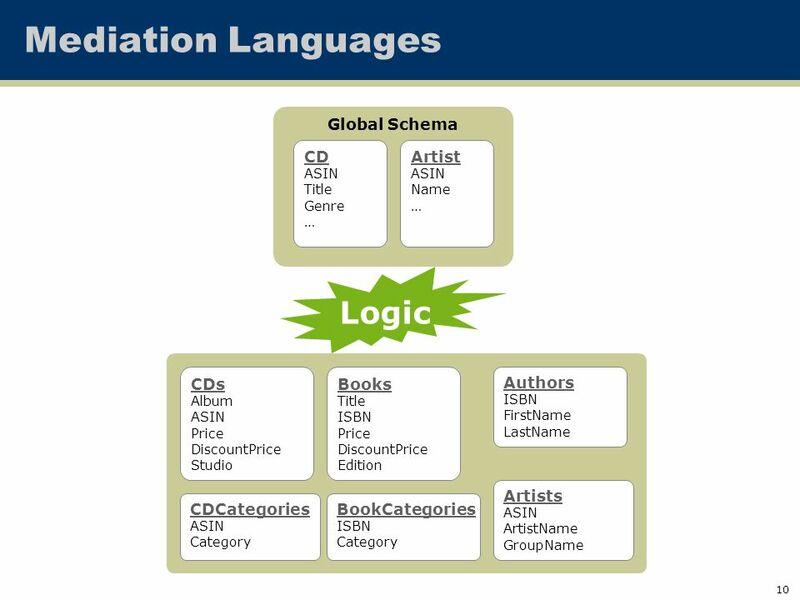 Information Integration Using Logical Views Jeffrey D. Ullman. 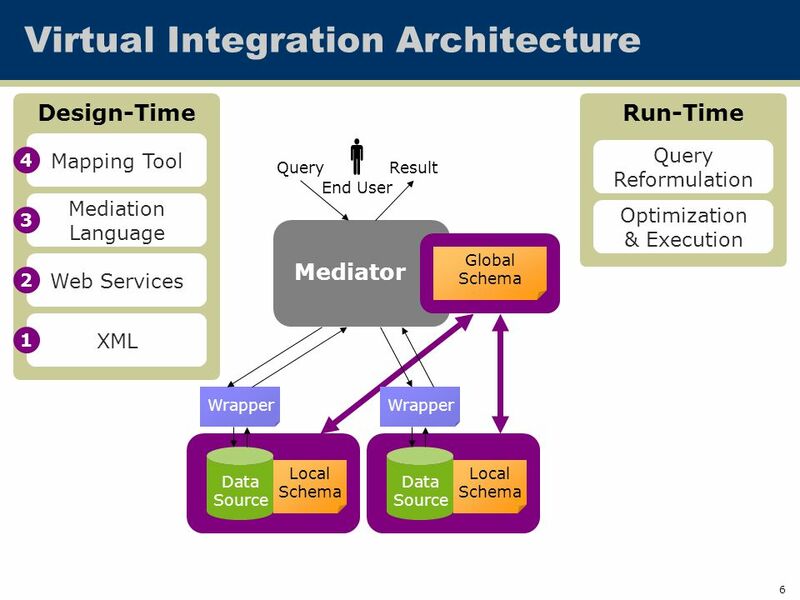 Data integration Chitta Baral Arizona State University. 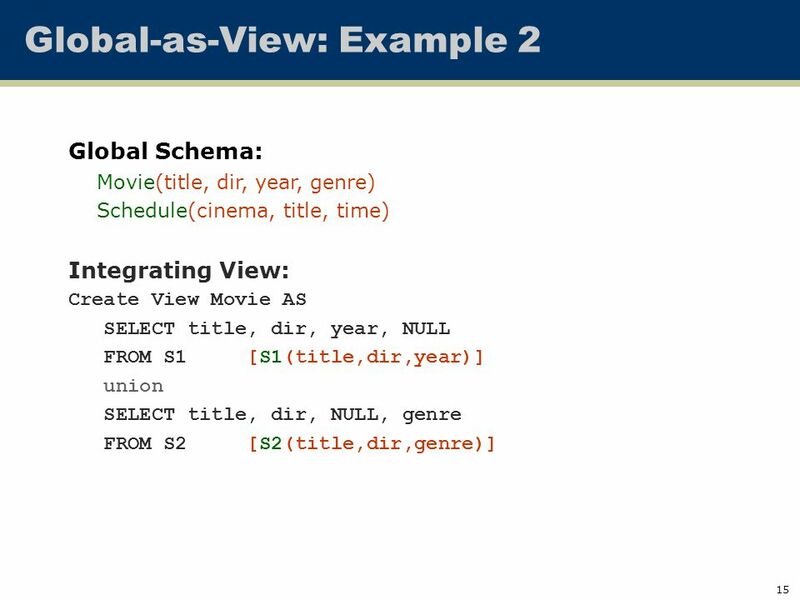 1 Global-as-View and Local-as-View for Information Integration CS652 Spring 2004 Presenter: Yihong Ding. 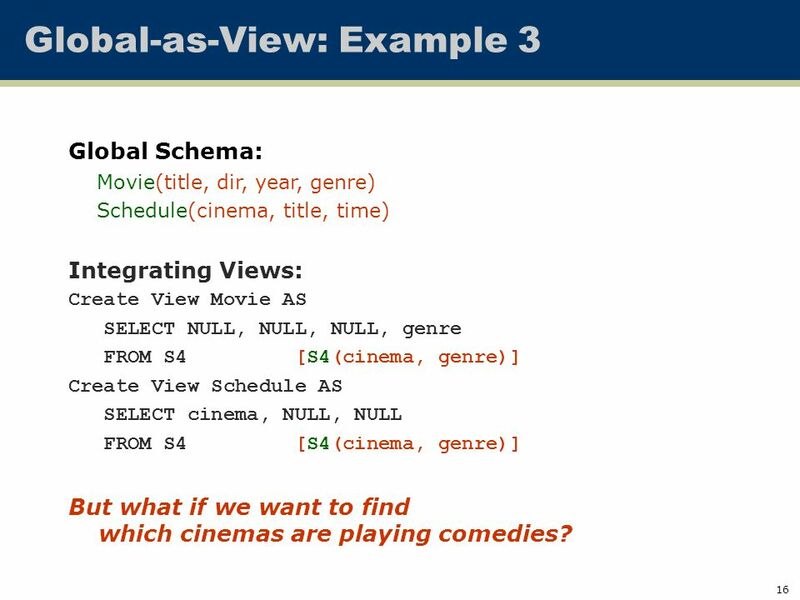 Corpus-based Schema Matching Jayant Madhavan Philip Bernstein AnHai Doan Alon Halevy Microsoft Research UIUC University of Washington. 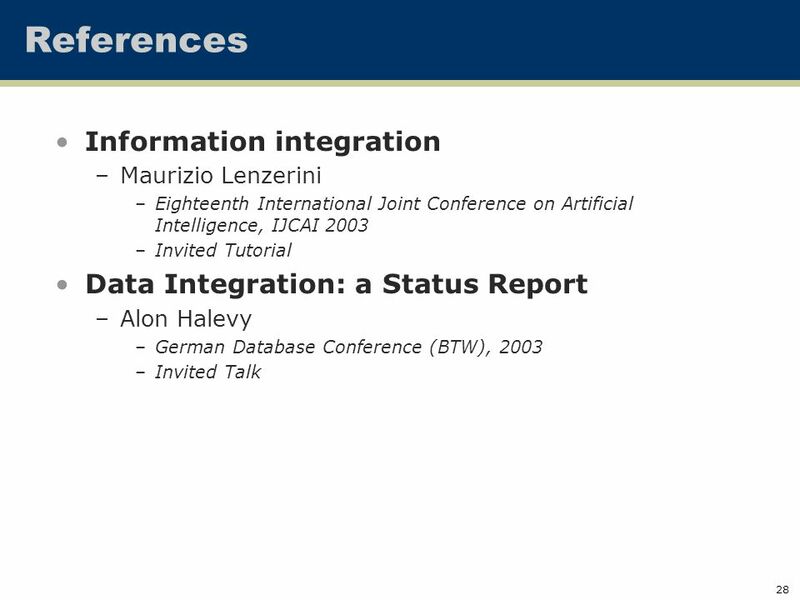 Data Integration: A Status Report Alon Halevy University of Washington, Seattle BTW 2003. BYU 2003BYU Data Extraction Group Combining the Best of Global-as-View and Local-as-View for Data Integration Li Xu Brigham Young University Funded by. Crossing the Structure Chasm Alon Halevy University of Washington, Seattle UBC, January 15, 2004. 1 CSE Students: Please do not log in yet. Check-in with Brian in the back. Review Days 3 and 4 in the book. Others: Please save your work and logout. 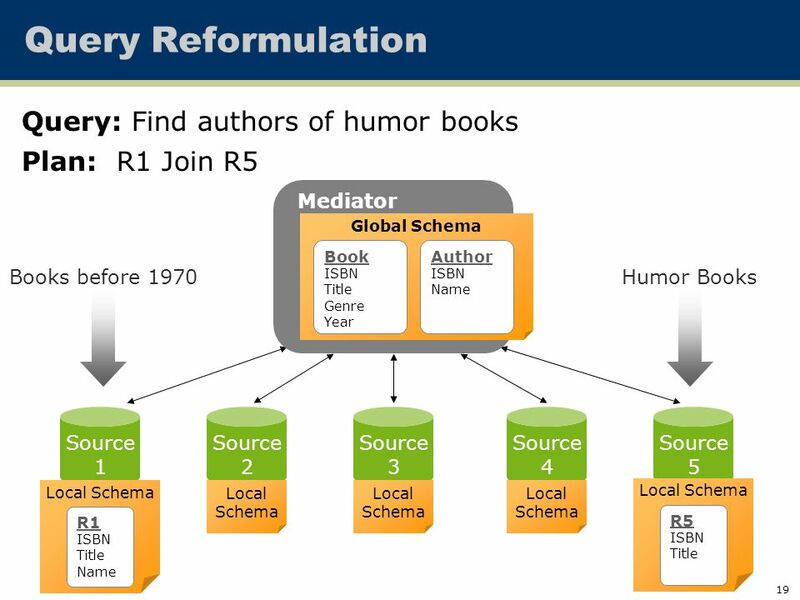 1 Lecture 13: Database Heterogeneity Debriefing Project Phase 2. 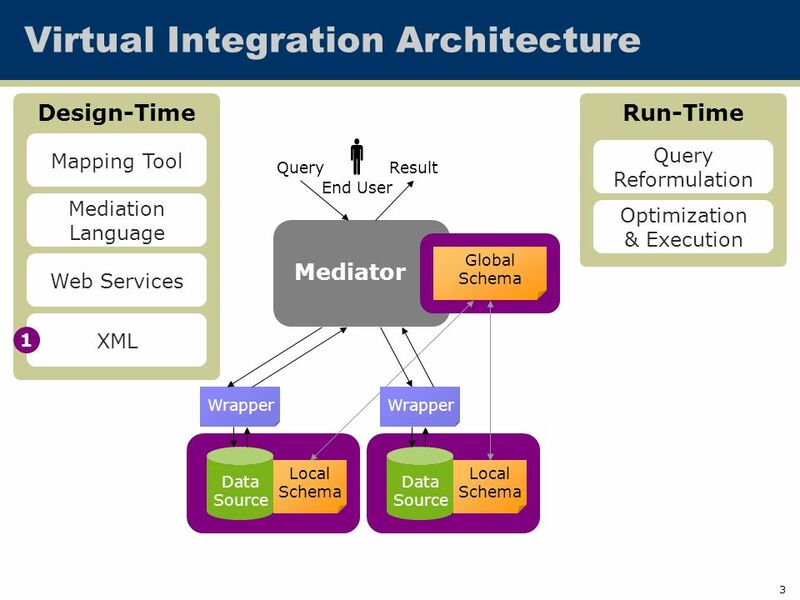 2005Integration-intro1 Data Integration Systems overview The architecture of a data integration system:  Components and their interaction  Tasks  Concepts. 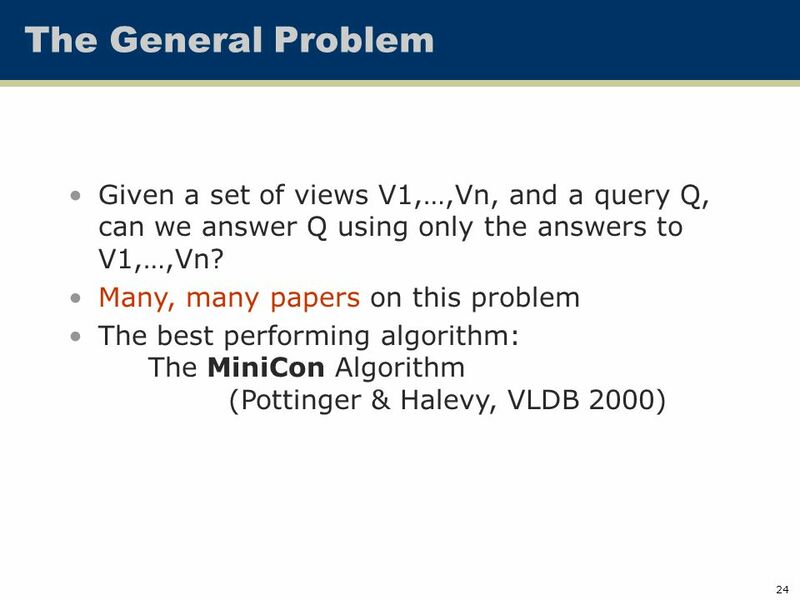 CSE 636 Data Integration Answering Queries Using Views MiniCon Algorithm. 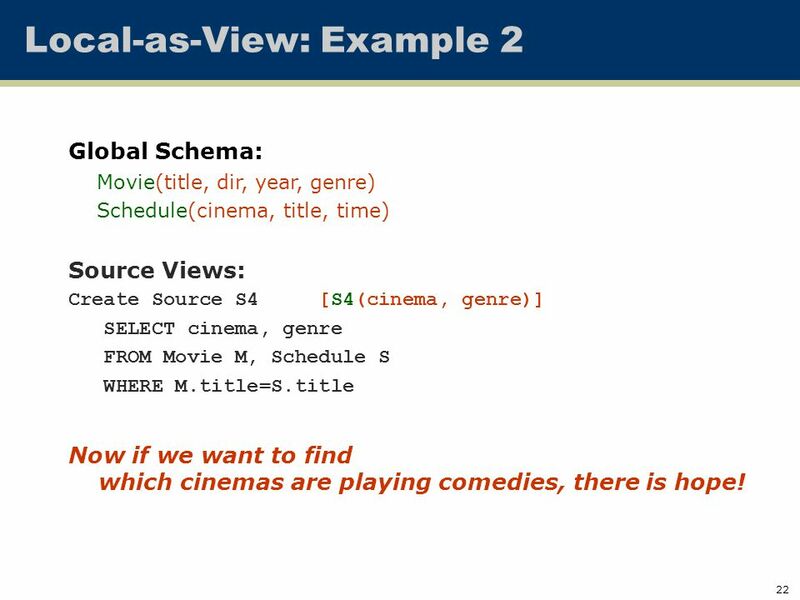 1 Lecture 13: Database Heterogeneity. 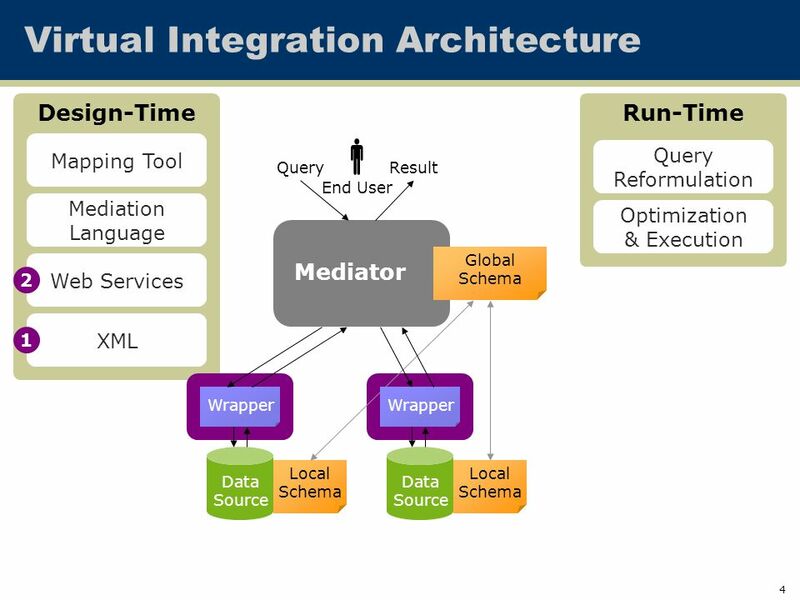 2 Outline Database Integration Wrappers Mediators Integration Conflicts. CSE 636 Data Integration Overview. 2 Data Warehouse Architecture Data Source Data Source Relational Database (Warehouse) Data Source Users   Applications. 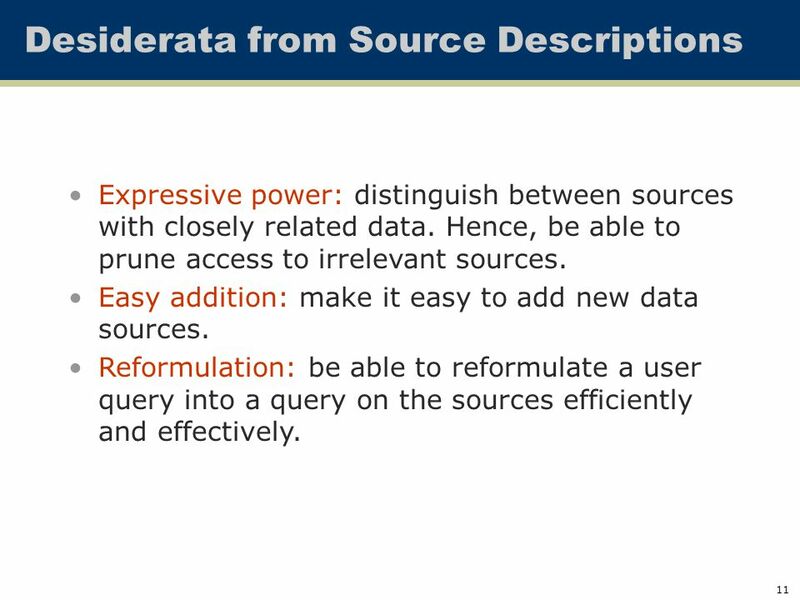 Describing data sources. 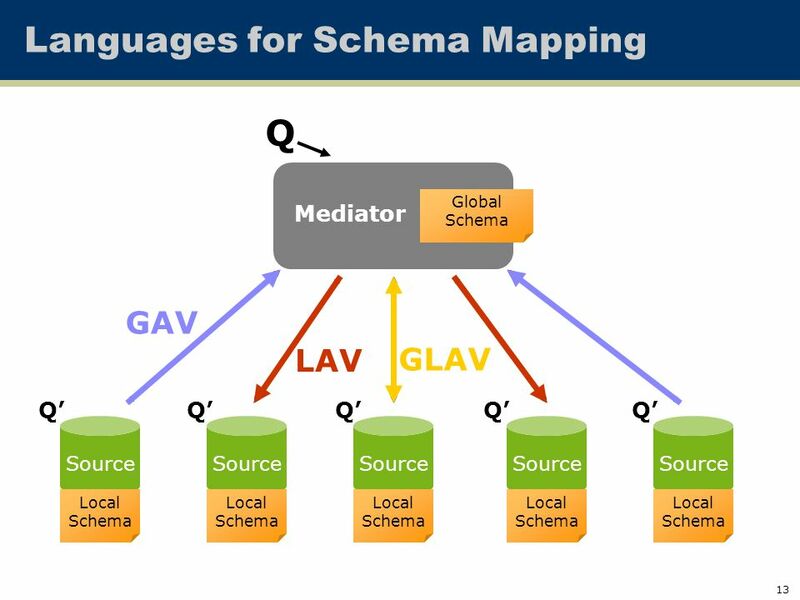 Outline Overview Schema mapping languages. Mediators, Wrappers, etc. Based on TSIMMIS project at Stanford. Concepts used in several other related projects. 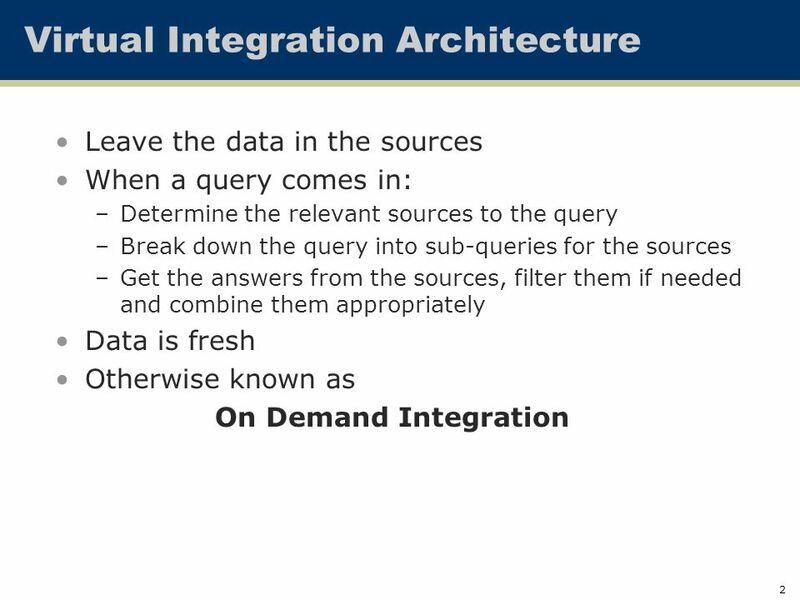 Goal: integrate info. in heterogeneous.